Exquisite custom Bayfront villa located in the gated community of Casa Marina in Shalimar. Escape the hustle, bustle and traffic of Destin for the prime peaceful cul-de-sac environment with only a short boat ride away to all restaurants, crab island, and the Gulf of Mexico. 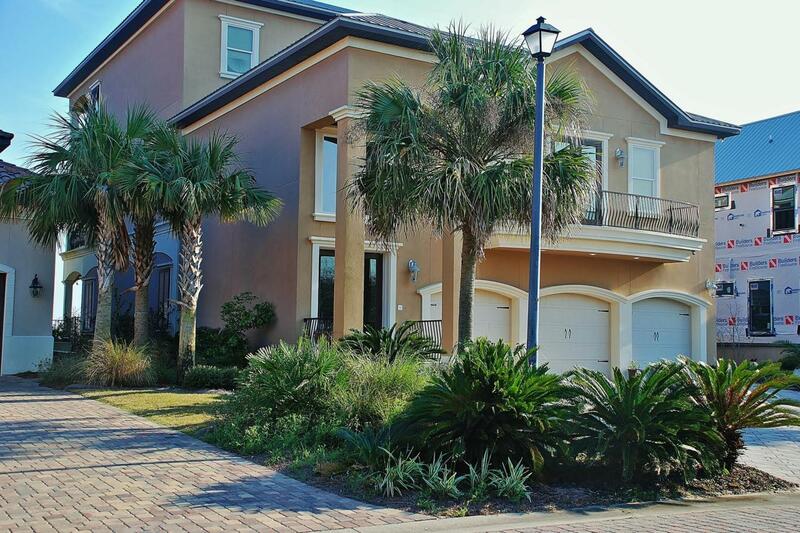 This 3 story, 3 BR, 4 Bath Masterpiece boast over 5,700 sq. ft. with numerous one of a kind features. Outdoor living at it's finest 3 decks, saltwater pool, 2 boat slips with lifts, flow through and trex decking, outdoor kitchen with grill, sear burner, sink,& bar. Wrap around doors and windows on the 1st floor kitchen, dining, & living allow amazing sunrises and sunsets. Kitchen contains triple sink, Kitchen Aide Dishwasher & Ice Maker, prep sink, side by side full size refrigerator and freezer, double convectionoven, 6 burner gas range, microwave drawer, granite countertops, self close cabinet doors and drawers with pullouts, large pantry, breakfast bar and full bath. Entertaining is a breeze whether the casual pool party or elegant dinner party. Spacious Living Room with built in entertainment center, gas vent-less fireplace, whole house sound system, wood panel ceiling. 3 car oversize garage with bar sink, wine cooler, 2 refrigerators. 2nd floor host the magnificent Master Suite with warp around water front balcony with fabulous views, wood and stone floors, sitting room, morning kitchen with wine cooler, wet sink, washer and dryer, 3 master closets with built-ins, sauna, granite double vanity, whirlpool tub, shower with bench, storage closet in laundry with fold away ironing board, linen closet. Guest BR with full bath. 3rd floor is a child or visitor's dream. Sitting Room, Breakfast/Morning Kitchen with wine cooler, microwave, & sink, Outdoor waterfront deck, Bar, Double Vanity, oversized shower with 4 rain heads, washer & dryer, walk out attic floored for storage. 3 Air Conditioner Units, On demand gas hot water heater, tremendous amount of storage, 3 floor/stop elevator, wood staircase. Over $500,000 in upgrades by current owner. This is truly a rare opportunity to own a splendid Bayfront villa. Once you take a look, this magnificent estate will literally take your breath away. Don't miss out. Schedule your appointment today! !